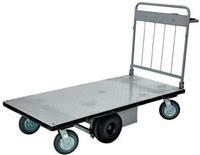 Battery-powered platform DC traction-drive system is ideal for moving heavy loads safely & easily throughout warehouses, offices, schools, & hospitals. Incorporate many features to make light work of heavy loads. 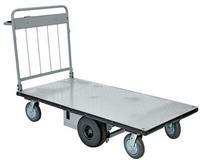 Reduce injury & increase productivity with this high quality cart. Features 800W electric drive motor, with (2) 45 Ah batteries for power and on-board charger. 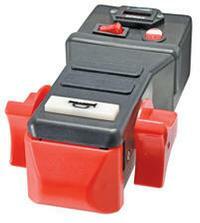 Handle includes fwd/rev throttle control levers, emergency stop button, battery level gauge, & slow/fast speed switch. Pinpoint turning is accurate with the mid-axle drive feature.